I love having the excuse to scrapbook my neices to get in my girly fix! The both have gorgeous blond ringlets and big blue eyes. Funny thing is one is on my side of the family and one is from my hubby's. My little niece, Sophie, just exudes confidence. She is so much fun to be around and even more fun to photograph! My husband gets a really kick out of her little attitude and tells my sis-in-law that it is like traveling back in a time machine to when she was little. 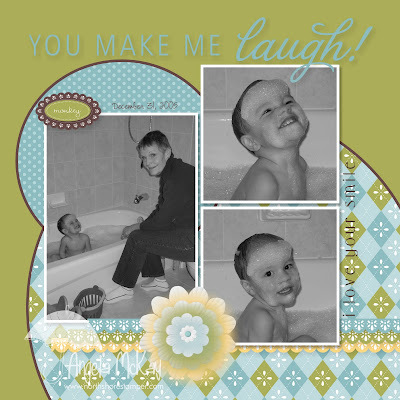 I realized that since I've been working on finishing up her scrapbook, that I've really neglected scrapbooking my nephew...hmm... another excuse to scrapbook... as if I need it! 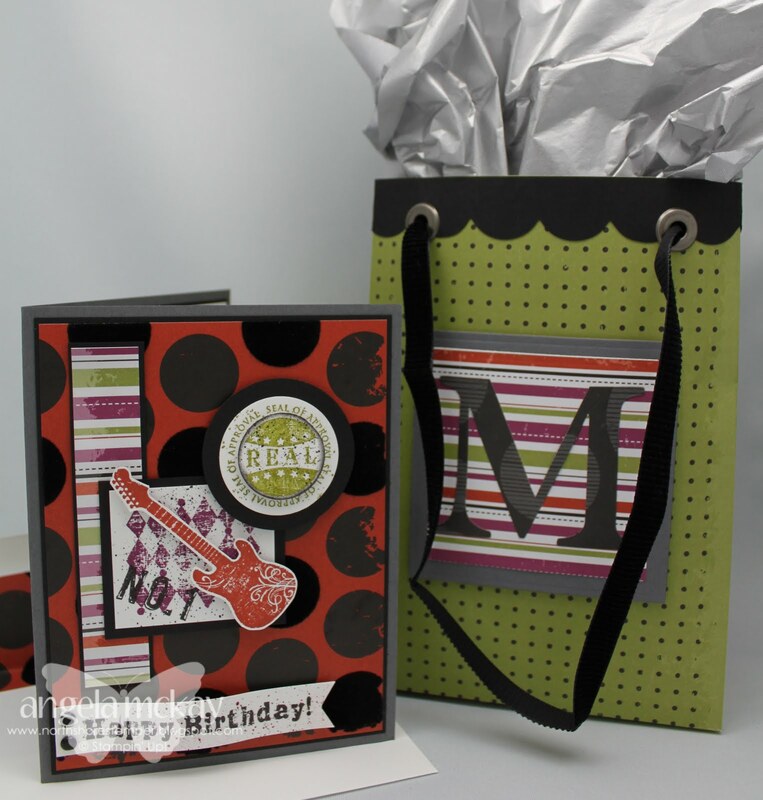 National Scrapbooking Month Promotion Starts Early!!!!! This fabulous promotion was not supposed to start until May 1st, but Stampin' Up has added to the already fabulous promotions in April and given you a couple of days of overlap! Make sure to check out these fabulous deals!!!! These can even be combined with your club orders if you choose!!! Class is limited to 8 spaces so RSVP early to avoid disappointment. 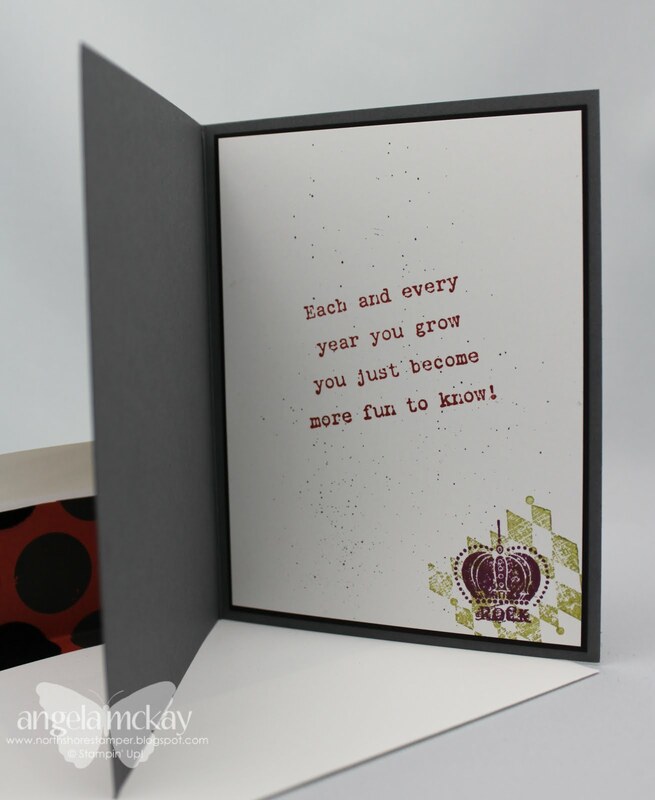 This week's Stampin' Royalty challenge is a sketch challenge. I really struggled with the large areas. I'm okay with the end result, but definitely not in love. What would you do to improve it??? 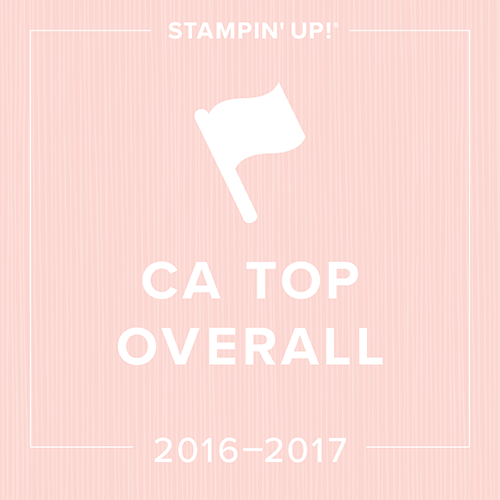 Come and join us at Stampin' Royalty; I'd love to see what you come up with! 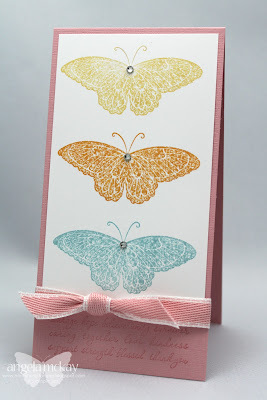 This gorgeous and fun card was the second make-n-take card from the downline meeting I attended last week! How happy does it make you???? 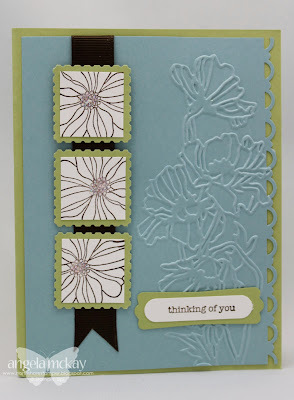 The inlaid embossing technique was such a great idea to show off the new Triple Blossom Bouquet Punch! If you want this punch, make sure to attend my Blossom Bouquet Class coming up on May 18th! Only 2 spaces left!!! 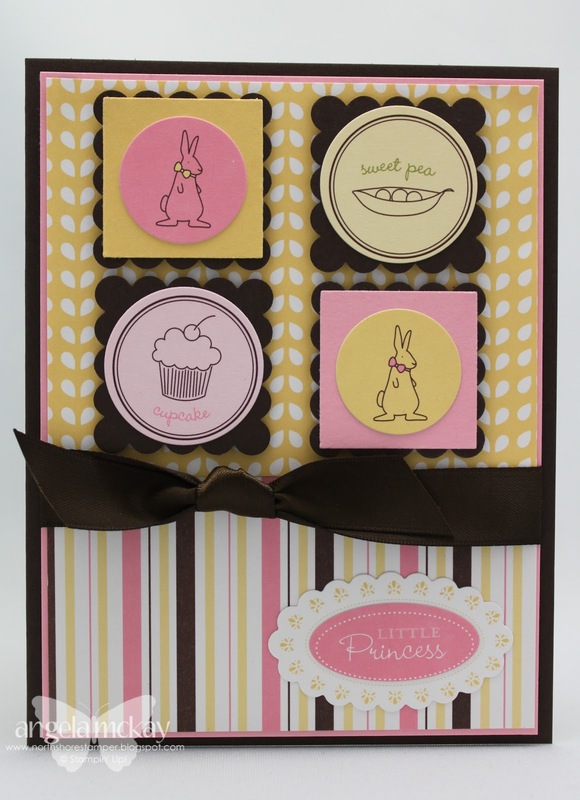 (Includes the Blossom Bouquet Triple Layer Punch, an adorable set of cards with packaging, and the chance to purchase the Bold Blossom Stamp set at 20% off the merchandise value cost. Please bring your own paper trimmer and paper snips to this class. This STUNNING card was created by my up-up-upline as a make-n-take for our recent meeting. It showcased two great new products from the upcoming Summer Mini. 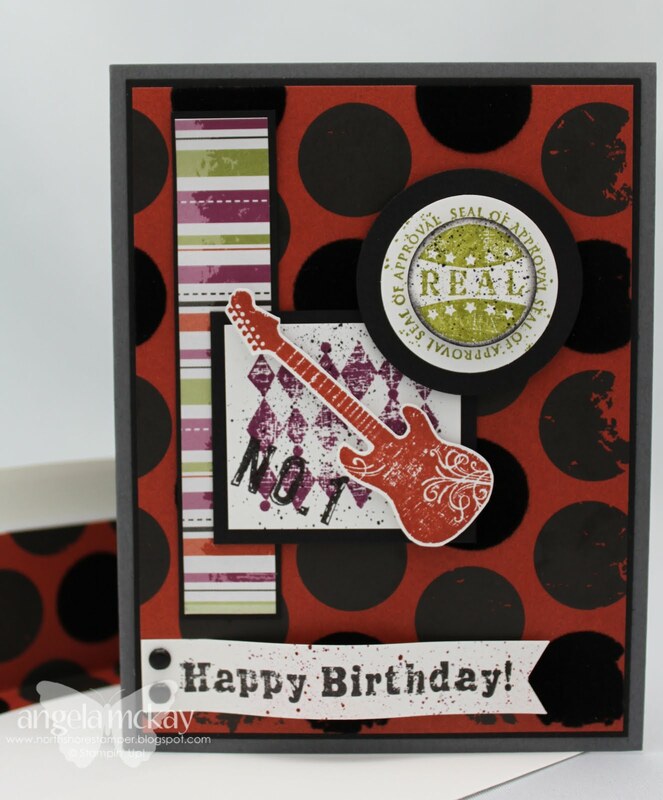 Isn't that Postage Stamp Punch perfect???? What do you think about the new Embossing Folder? I love it! In fact, I love it so much that starting May 1st, with the launch of the new Summer Mini, I will be giving away one free with every $60* order from May 1st- May 7th! (your initial $25 of club orders can not be included in this). 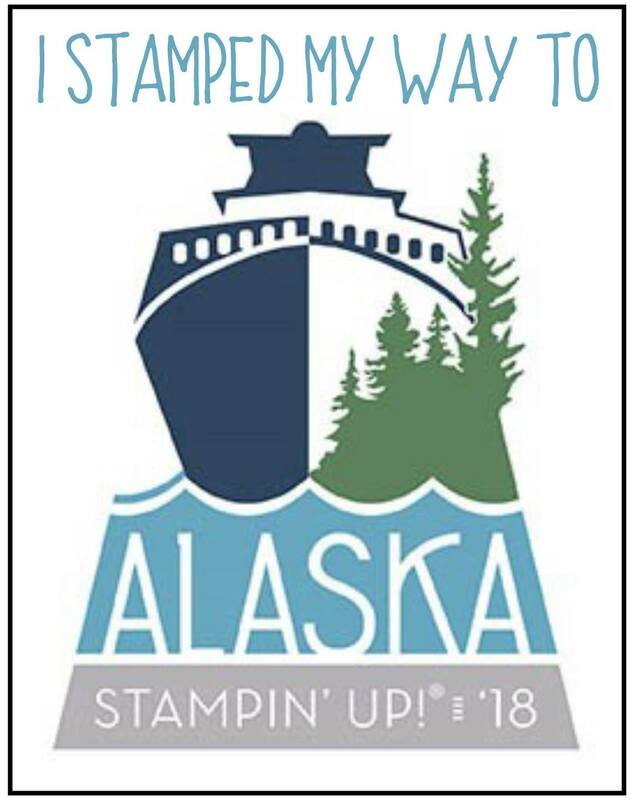 If you're dying to get yours ASAP, make sure to have your $60 order to me by April 30th as I will be waiting up to place an order at 12am on the 1st of May:) If you place your order online, I'll be mailing out your Embossing Folder to you as this promotion is only from me and not from Stampin' Up! So make sure to mark your calendars now so you don't forget to place your order. It is always a little embarrassing when mom drops the ball on a special occasion. We left last Thursday for the Okanagan for our Easter weekend and I realized after we'd arrived that I'd left the boys Easter cards in Vancouver. 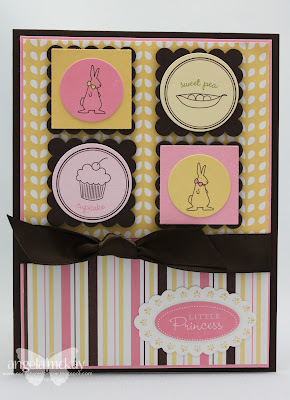 Thank goodness I had the "So Cute" stamp set in my craft bag that I'd take along! I whipped a couple of these up quickly! 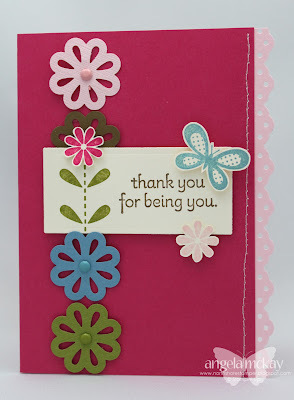 I hope you are having a fabulous weekend with your families! Happy Easter! The new Stampin' Up downloads that are being released are CRAZY! I'm just hoping that some of these new DSP's are in the upcoming catalogue! The new Sunset Serenade DSP is so retro looking... I can't wait to do more pages with it! Was I ever excited when I saw the new downloads! Some of my old favourites are back! If you were as in love with the Urban Garden DSP and the Roof Garden Accents and Elements you will be thrilled! Don't forget that with a $60 online purchase (not including club orders), you can choose a free package of Designer Series Paper! This is my own special promo, so make sure to email me your choice of DSP after submitting your online order! I've decided that I give my six year old son way too much input into my cards! I finished this birthday card for a friend of his the other day, and I showed it to Joe to make sure that he liked it. His was response was, "Well, it's a cool card mom, but couldn't you put Mason's name on it with all those letter stamps that you have?". Needless to say, that was what prompted me to head back down to my room and create the custom monogrammed gift bag! This was one of our club cards this week. 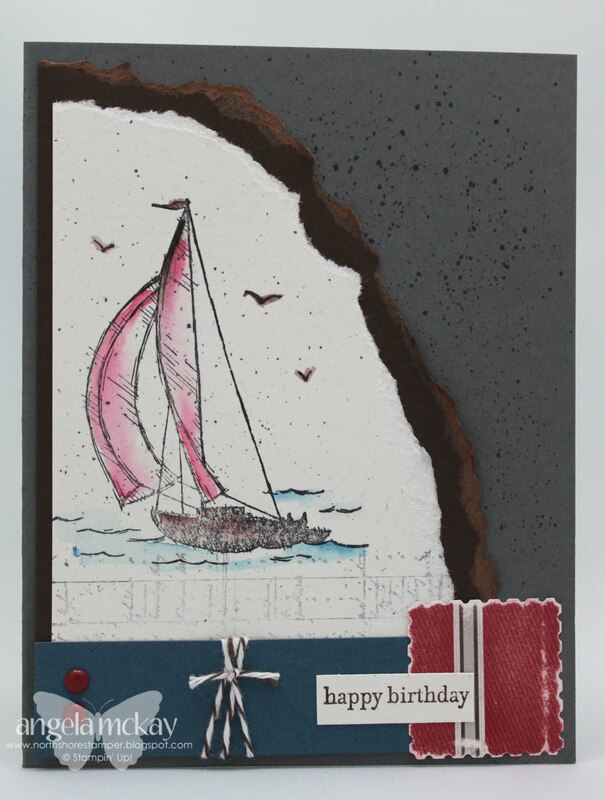 I came across this card on the Brick Wall Technique and thought that it was great for a masculine card(scroll past the instructions for the actual card)! Cathie did a great job of explaining the measurements too! I adjusted mine slightly for club as I was sure that the ladies might stab me with their paper piercers if I had them sponge all those little pieces, but I used the same concept! 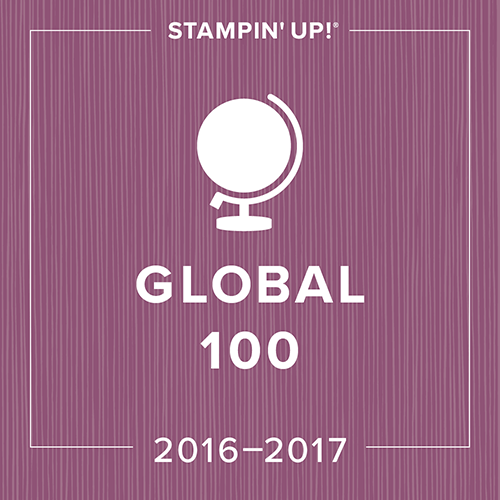 All my club girls agreed that this these stamps are a MUST if you are looking for something masculine. Only 2 weeks until you can order yours from the new Mini! Thanks so much ladies for the great time! I admit that I've been looking forward to Saturday's now. 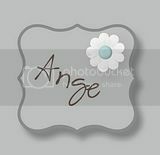 I love the ease with which I can produce My Digital Studio pages. Setting a specific day of the week that I'm going to post my pages has really kept me on track for the past few months. 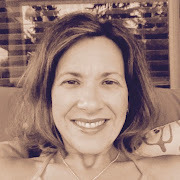 My books are getting done and I'm getting that feeling of freedom that comes with getting caught up. Now I've just got to hope that my kids don't do anything cute that I need to photograph for the next twenty years! 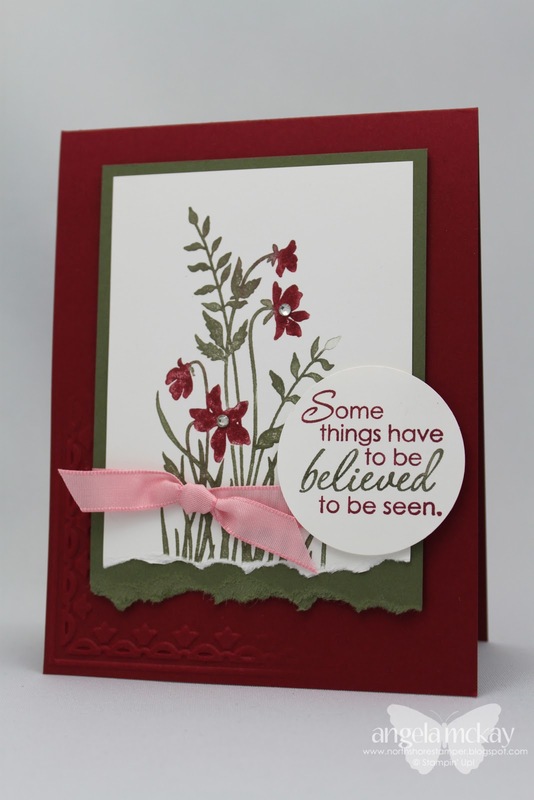 As I've said many times before, when I'm struggling with my creativity, I look for some great cards to CASE! 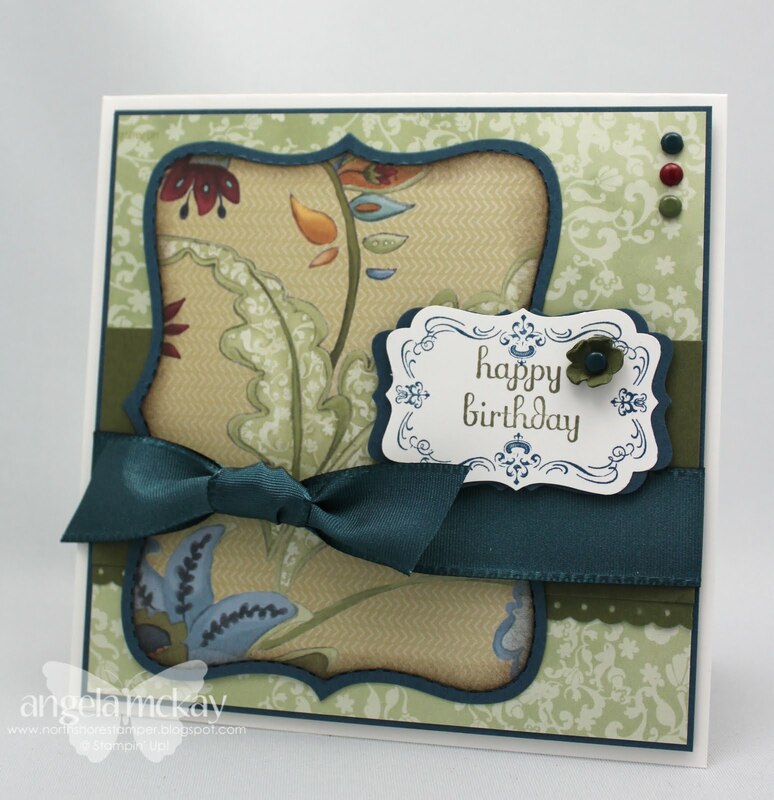 I love this quick and easy card from Dawn Olchefske. I've had a lot of fun playing with the SU notecards recently... how I missed those for 8 months of the catty I'll never know! What do you do to get yourself out of a slump? Thank goodness it's club week! I've been dying to see all my girls! With my dad's surgery, I've really cut back on classes this month. We weren't sure how things were going to play out, and I've been lucky enough to get to spend the recovery time with my dad. The last thing he needed was a bunch of us crazy stampers letting loose in the basement:) Club; however, was not up for debate. These ladies are family, and I will admit... my sanity! I really look forward to our monthly meetings. 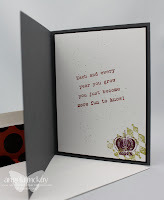 This week's Stampin' Royalty Challenge is a spring theme. Growing up with a house full of men has made me stop thinking of spring in terms of flowers. I now see spring as swimming lessons and baseball! This week I'm going to share with you a few new pages that I've been working on with those themes! 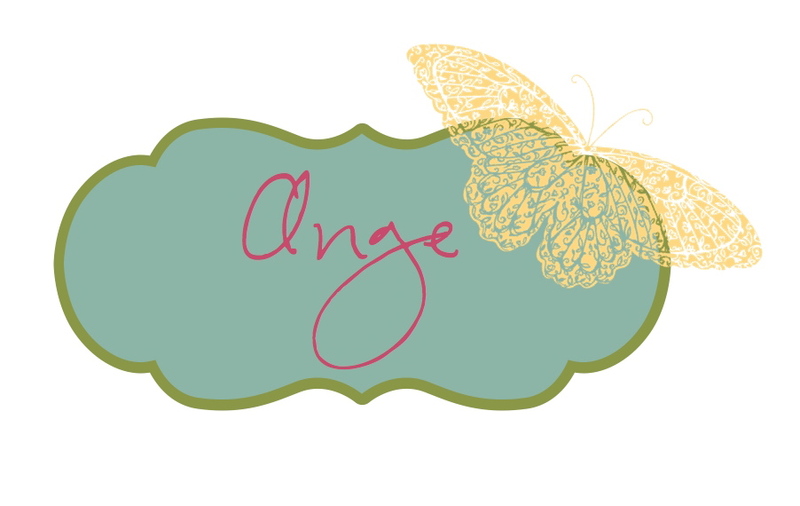 I'd love for you to come and share your spring themed projects. Please feel free to inundate us with flowery things... I'd love to remember what that world was like! I'm really hoping that my signature picture comes back up tomorrow, not quite sure what is up with photobucket! There are some great new digital downloads available already this month. Make sure the check them out! Don't forget that with a $60 online purchase (not including club orders), you can choose a free package of Designer Series Paper! This is my own special promo, so make sure to email me your choice of DSP after submitting your online order! Here is another CASE from the upcoming Summer Mini. Looking at it now I can see that I really need to work on being able to sew in a straight line! (it's harder than it looks when sewing on paper;) Isn't that punch gorgeous? 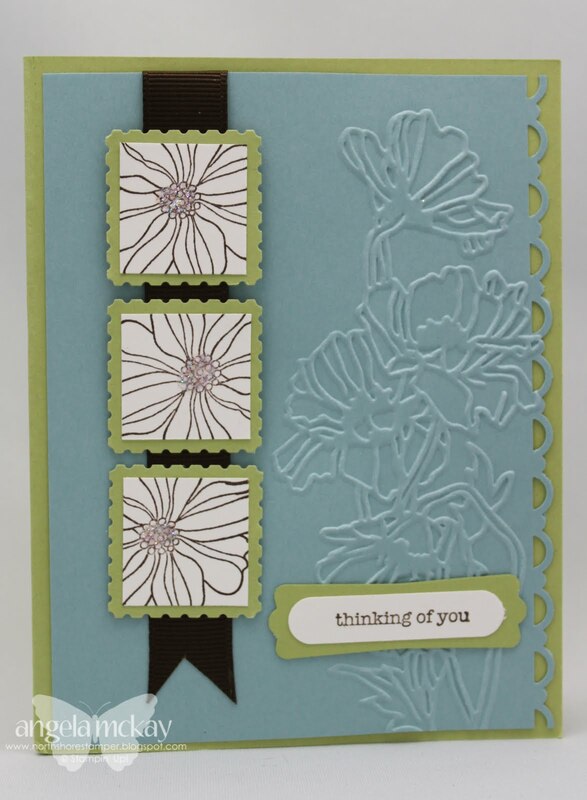 That is the same one that I used on the scrapbook page the other day... just another one of the triple layer punch options! I don't know if you had a chance to check out UStamp this session, but there were some fabulous ideas! 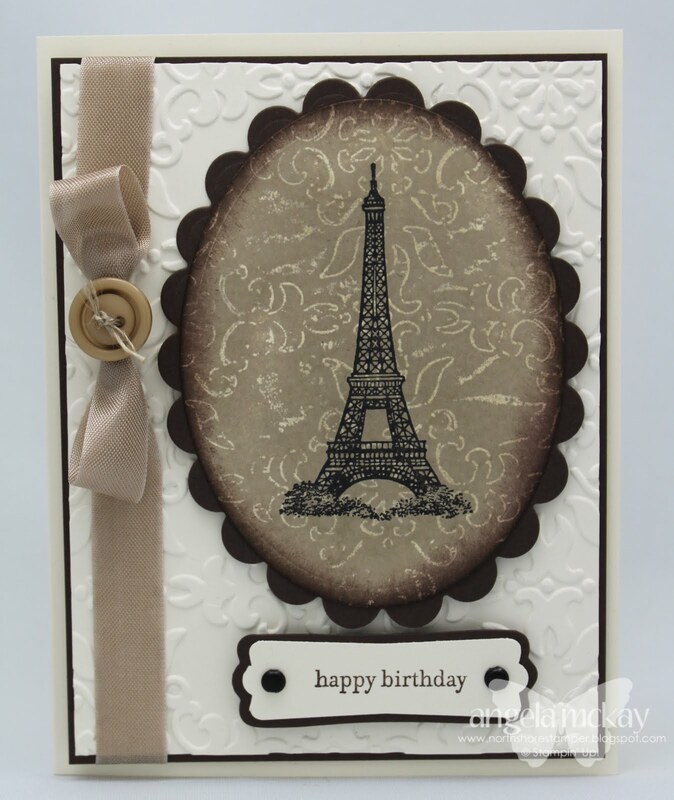 This card was one that I made up using one of those ideas! 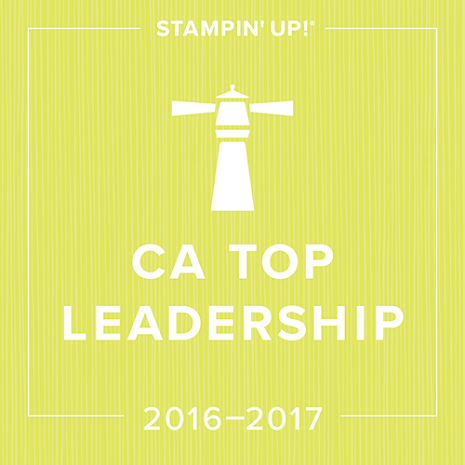 Do you like my "A" stamp? 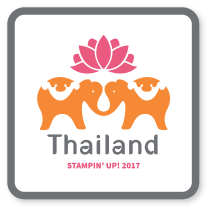 Make sure to go and check out UStamp to find out how to make your own! 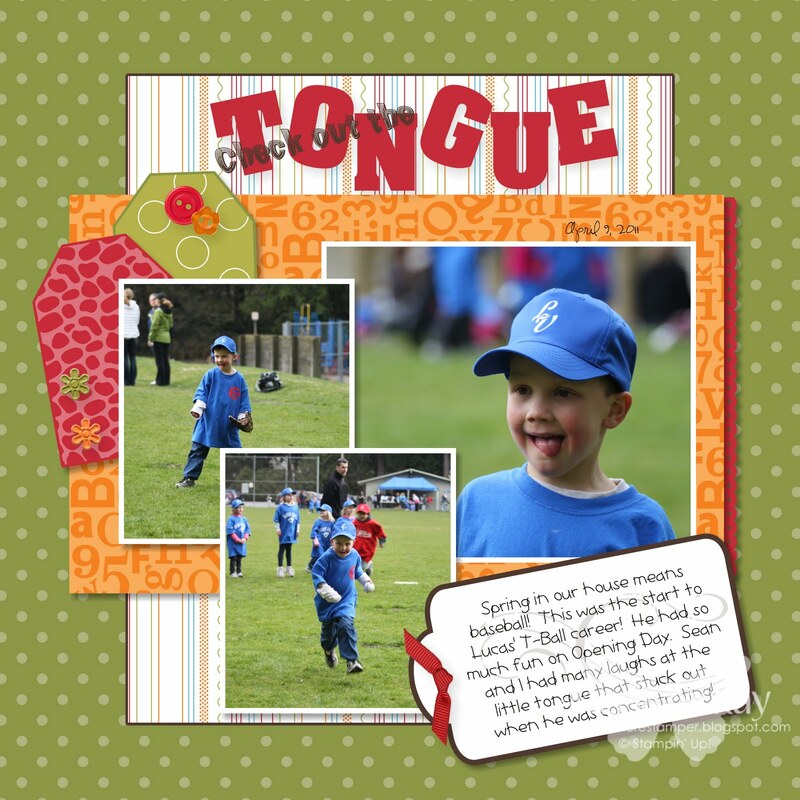 I LOVE this scrapbook page! I case'd it straight out of the upcoming Summer mini! I was having so much fun with the new triple layer punches that I just had to try to recreate this page. I think that we may have to use this one at Scrapbook Club next month..., but I'm seeing some masculine colours and mixing in more DSP. What do you think? I love the simplicity of this layout and the way that the colours brought life to my photos! These gorgeous DSP's were from the Leadership 2011 Digital Download. Just to explain the dog on the page... we were leaving on a road trip from Vancouver to Winnipeg. I was packing in Joe's room when he crawled out and disappeared. I couldn't find him anywhere and I was beginning to panic; turned out he was hiding in the dog's bed! Showing Off some new DSP! 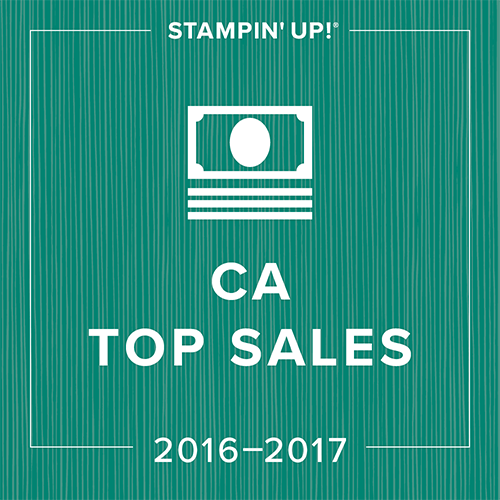 New Clearance Rack Items and a Promotion From Me! Grab Bags are up for GRABS!